When someone mentions The Nutcracker to you, what do you think of? Do you think of a bowl of nuts and a silver-coloured gizmo to open them? Or do you think of sugarplum fairies, toy soldiers, and a little girl named Clara? Of course it’s the second option, and Maestro Classics has just this month added The Nutcracker to their classical music library for children. We’ve been loving Maestro Classics (this post contains affiliate links such as this one) since we were first introduced to them last year with Casey at the Bat and My Name is Handel (You can see our review for those here). In fact, we enjoyed those first two albums so much that I’ve gone on to purchase Swan Lake and The Sorcerer’s Apprentice as well! 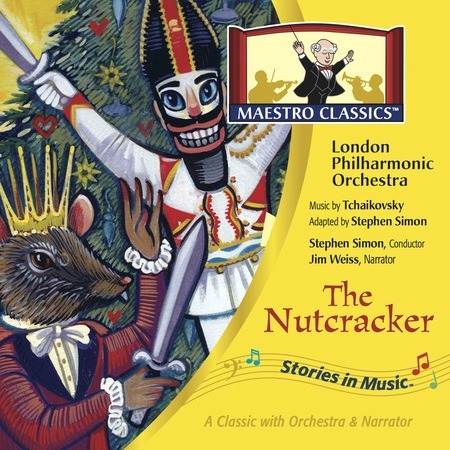 We received a digital download of The Nutcracker, but it is also available in as a physical CD. The digital download consists of MP3s as well as a PDF with all of the information that is included in the booklet that comes with the physical album. There are 21 tracks on the album, which has a playing time of 58 minutes. 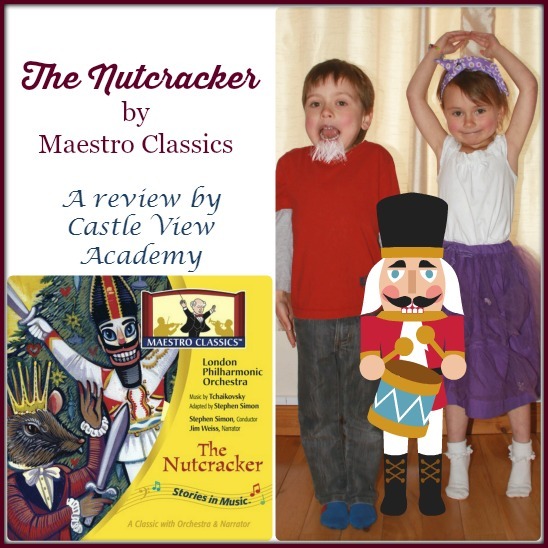 Shorter than the original full-length version of The Nutcracker, but it tells the story well in a concise manner so that it is not so long that children will become bored listening to it. There is a mix of instrumental tracks, as well as tracks that have narrations that tell the story so that children are able to follow along and see the story in their minds. Getting this background information is important if one has not seen The Nutcracker performed. I was priveliged to have been taken to The Nutcracker once as a child with a friend and her family to celebrate her birthday. I don’t remember much about it now, but it was the first ballet I’d ever seen live and I really enjoyed it. Although there will be a performance here this year, we aren’t in a osition to be able to take our children, so instead we set about finding a way for them to watch it at home. (We’ll be finding a better version to watch again in the future, but the children were able to then understand more about ballet and The Nutcracker story from watching). Jim Weiss does the narration for this classic, and of course, the London Philharmonic Orchestra is again conducted by Stephen Simon. Tchaikovsky didn’t think this was his greatest work, but so many would disagree and this is proved by the lasting adoration of Nutcracker fans. Even if you’ve never seen The Nutcracker, you’re sure to recognise many of the pieces on this album. The PDF included two activities for Tristan to do; a cross word and a word unscramble. He worked on these on and off as the children listened to the music and narration. When he heard an answer to one of the cross word problems, he ran over to his sheet and filled it in. There is also information about the history of ballet, the harp, and Tchaikovsky. On the Maestro Classics website, you can also find additional information. Through here the children have watched videos and learned more about The Nutcracker, how nutcrackers are made, and about some ballet stances. While we were all watching the movie, the kids were telling Phil all about nutcrackers! We’ve all listened to The Nutcracker several times this month. Usually we listen to it in the afternoon. While the children are playing, the album is on in the background. The music is beautiful, and a pleasure to listen to. Sometimes Kallista would get up and twirl around the livingroom while listening. Tristan enjoys pretending to be a nutcracker! 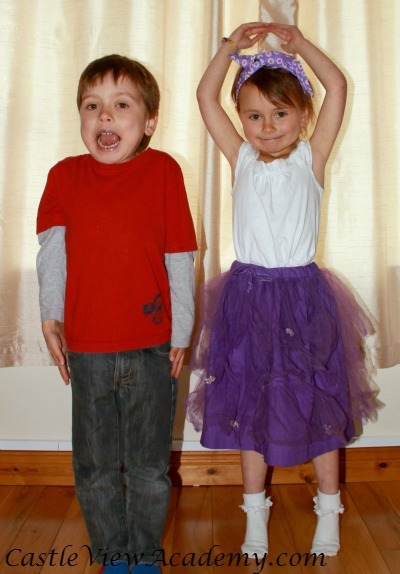 In fact…Tristan now stands like a nutcracker while he gets a little help brushing his teeth. It’s always been a struggle to get him to open his mouth wide enough – but not anymore! Tristan and Kallista have also listened to it while drifting off to sleep at night. I wonder if they dream about sugarplum fairies, princes, and magical lands? Once again, Maestro Classics have produced a top-rate product (and just in time for Christmas gift-giving). Our entire family have enjoyed listening to this album, it isn’t just for children. Anyone who hasn’t seen The Nutcracker, or who would like to learn more about it would learn from this album. Although this is traditionally a Christmas title, the music can be enjoyed at any time of the year, so don’t be surprised if you pass by and hear the sound of Russian Dance floating out our windows in the middle of the year. To read more reviews about Maestro Classics by the Schoolhouse Review Crew, click on the graphic below and follow the instructions. You will find 100 honest reviews by the Crew for both The Nutcracker, as well as Peter And The Wolf. If you’d like to know more or would like to follow Maestro Classics, you can connect with them through their website, Facebook, Twitter, Pinterest, and YouTube. Sometimes we have a strange way of doing things around here…but whatever works! How fun! I’d thought my kids were too young for The Nutcracker but this is a great way for the little ones to enjoy it. Love, Love, Love the Nutcracker! Have so many wonderful memories of seeing it live when I was little, and now with my daughters! It’s fantastic that you are able to share the joy with your daughters and make memories with them, too. Merry Christmas! I’m not yet feeling ‘in the spirit’ but the music does help liven things up!